Address your audience’s desires, and if possible, show how yours align with them (especially if you’re working together towards a common goal). Furthermore, offer them a vision of themselves in possession of their desired outcome. Give them specific instructions or tactics to employ. Throw in a joke to lighten the mood, and (if possible) the audience’s fears. Comfort the audience and show that you’re beside them to support, protect, and guide them. Demonstrate that you’re worthy of their trust. 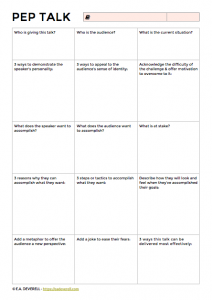 Offer a metaphor that gives the audience greater perspective on the challenge. Remind the audience of the reasons why. Make the speech timely, succinct, and to-the-point. Also, if possible, deliver it in a place that supports the message, or makes it more memorable. The character’s home is often the main setting of the Ordinary World, and the environment in which the reader first encounters them. The people the character lives with at the beginning of the story not only help shape the character, they also help create the Stasis (beginning) state and the Resolution (end) state that define the character’s development arc, and also set the story in motion. The character’s cohabitants may be their family, a team, a crew, or any other group of people they’ve fallen in with. For more guidance on this subject, you may like to read the sections titled, ‘How to Generate the Supporting Cast’, and ‘How to Create Character Groups: Teams, Crews, Families & Pantheons’ in How to Be the Heroine of Your Own Story. 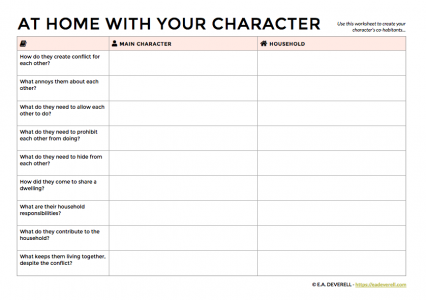 As with last week’s Protagonist / Antagonist worksheet, you can use the character to brainstorm the rest of the household, or vice versa. Do they need to be allowed to miss meals? Do they need to be allowed to bring strangers home? Do they need to be allowed privacy? You may want to consider the household as a whole, or to choose one or two representatives to study. If the character lives alone, you may nevertheless like to consider their neighbours, or a part of their backstory during which they did live with others. 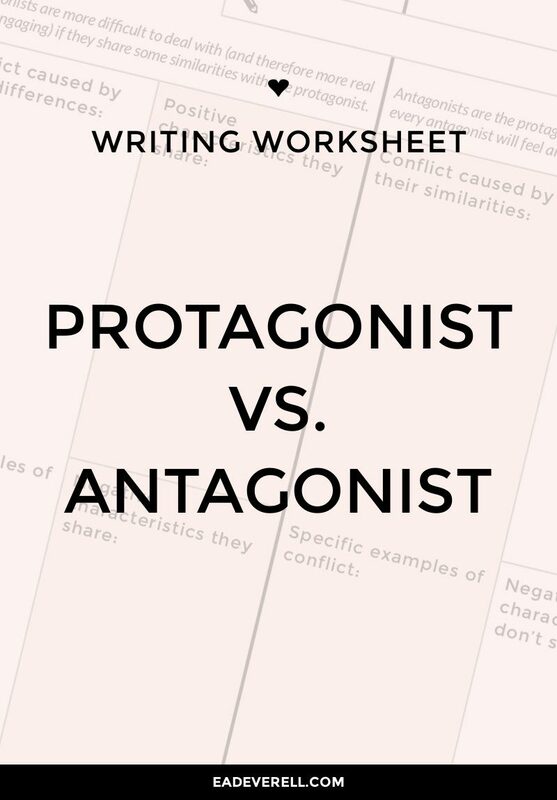 Antagonists are a simple way to introduce conflict into a story, and the quickest way to create an antagonist who will fit in with the protagonist’s plot, is to consider their relationship. What makes the antagonist difficult for the protagonist to deal with (and vice versa)? Antagonists who bear similarities to the protagonist are more difficult for the protagonist to deal with, because the character can’t completely distance themselves from them, and can’t knowingly treat them as “other” or “bad”. 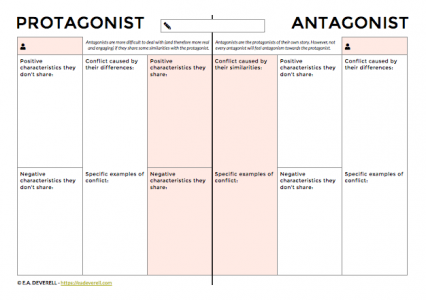 Giving the antagonist both positive and negative qualities can also make them more difficult for the protagonist to overcome, because it makes them more human and more likeable. Note down your story title at the top. Write down the character names in the shaded boxes on either side. Remember, protagonist and antagonist are relative terms; the antagonist is the protagonist of their own (life) story. 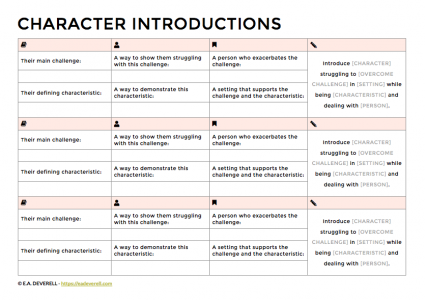 List the negative and positive characteristics that each character possesses. Note down the conflicts that might arise from the differences or similarities between the characters. Create specific scene examples that demonstrate the conflict. Specific examples of conflict: a scene in which P steps in to defend a co-worker who is being criticised by their boss for breaking equipment, and A argues that the co-worker ought to have done their job better. Conflict caused by their difference (to the protagonist): the antagonist is eager to please the boss by making the co-worker look bad. Specific examples of conflict: a scene in which A tells the boss that they did extra research and learned not only how to mend the broken equipment, but also how to operate it more efficiently. Specific examples of conflict: P’s parent arrives at their workplace to confront them about putting work first, and embarrasses them in front of A. If you’re working with The One Page Novel & Heroine Frame methods, you might like to pick the Positive characteristics from Stasis ARTs that are to be Transferred, and the Negative characteristics from Stasis ARTs to be Abandoned or Repurposed. and How to Create Relationships. 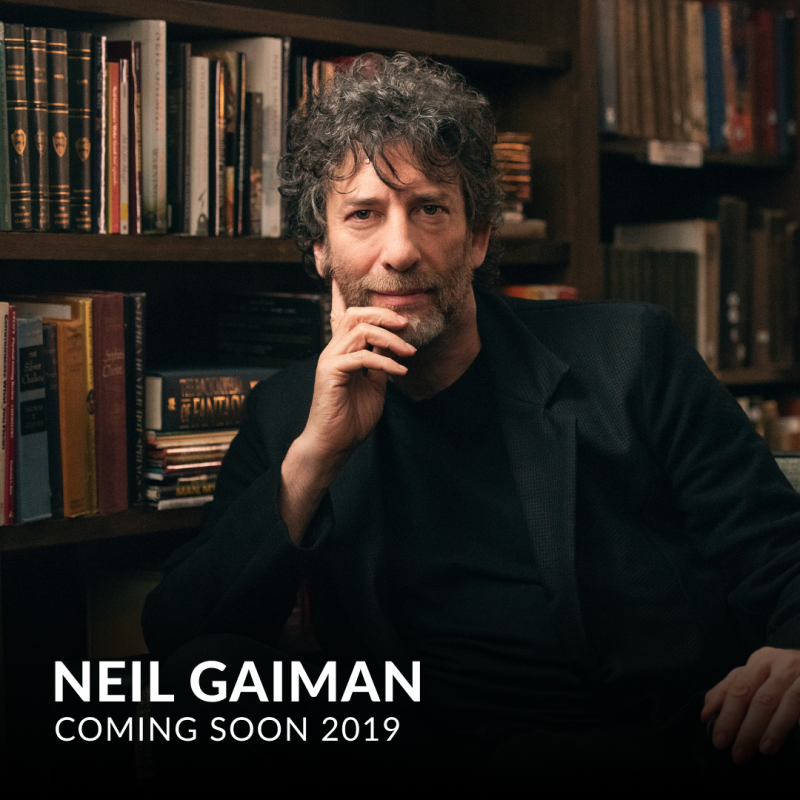 If you’re getting ready to begin your NaNoWriMo novel, chances are you’ll be introducing a character or two very soon. This worksheet offers a simple formula to help you decide how your character will meet your audience. When we meet Lyra, she is being characteristically curious, rebellious, and brave, and struggling to evade authority somewhere she isn’t supposed to be, while trying to deal with Lord Asriel. Bilbo is preoccupied with avoiding adventures, and maintaining a comfortable, orderly life in his hobbit-hole, which Gandalf tries to disrupt. Harry’s challenge, as he struggles with everyday life with the Dursleys, is being different in a very ordinary setting. The main challenge the character faces will usually be internal, although this may unfold and become clearer over time, and at the beginning of the story only appear as a small glimpse of the symptoms of the larger problem. The character may be mentioned or may appear in the story before their introduction. You can bend chronology, especially if your character is too young to be doing much at the beginning of the story. Introduce the character in a flashforward, through foreshadowing, or in a prologue. It may help you to imagine introducing your character to the reader as though you were introducing two people at a party. What would you want the reader to know about your character, and how could you communicate this information for best effect? P.S. 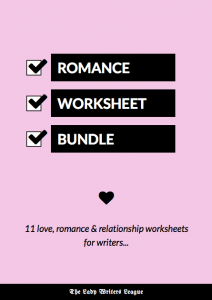 If you enjoy this worksheet, you’ll love the fill-in-the-blanks scenes of The One Page Novel templates. 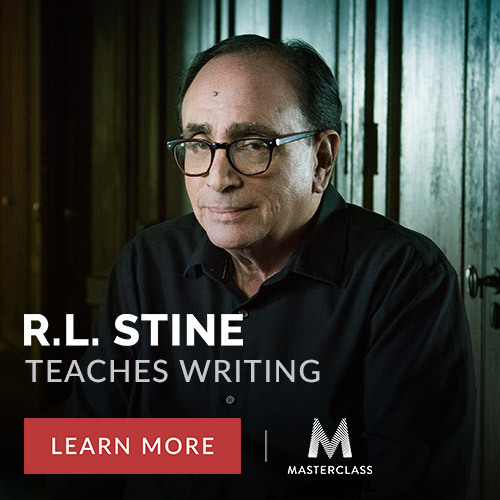 When writing long stories, novels and series, it’s easy to lose track of characters and introduce inconsistencies, discrepancies, contradictions, and even plot holes. 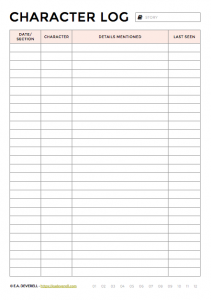 For general plot action I would recommend creating a story spreadsheet, and for keeping track of characters’ minds, you might want to log who knows what when, but for remembering things like physical descriptors, relationships, and mentions of likes and dislikes, a character log is a really simple solution. In the first column, note down the date and/or the story section where the character is mentioned. In the second column, note down the character’s name. In the third column, write any details that you think are important to remember. If your manuscript includes a long description with many particulars, you may want to note down a general category – such as “family”, “appearance”, “clothing”, or “favourite food” – instead. 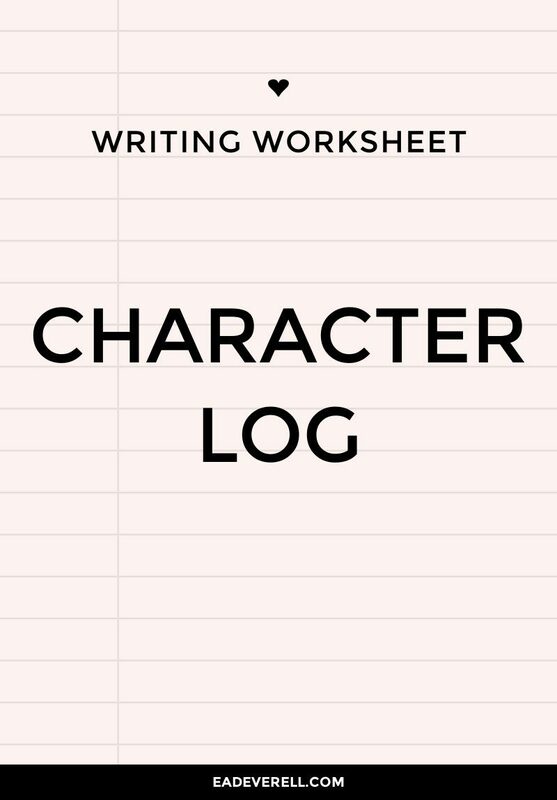 The character log isn’t for every mention of a character. Rather, it’s to help remember those small details that aren’t vital to the plot, but that need to stay consistent throughout. You may want to colour code the characters to help you spot relevant entries in the log. You could also colour code mentions of a specific category. When you’re beginning a writing session, quickly check the last log entry for each character to see where you left them. 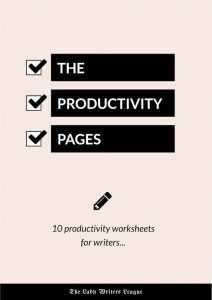 This will help you avoid unintentional teleportations, and can ease your way back into writing the story. 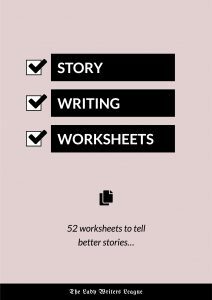 You’ll probably need more than one page for longer stories. 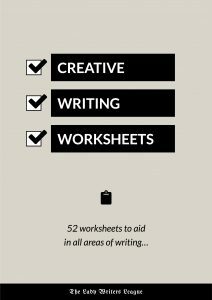 Use the numbers at the bottom of the worksheet to mark the order in which you fill out each copy. It can show you if you’re being too repetitive or “over-informative”. It can help you emphasise certain points or characteristics. It can help you when you come to edit, especially if you decide to change or omit a detail. When it’s time to edit your story, go through each entry in your character log for each character, and check that all of the details are consistent and cohesive.